A new collectable wildlife badge has been launched to raise money for the Mendip Hills Fund. The new badge features the iconic barn owl that can be seen silently hunting across the Mendip Hills Area of Outstanding Natural Beauty. The barn owl is one of the most popular and recognisable birds but over the last 80 years the UK population has dropped by 70%. They can still be seen across the Mendip Hills hunting near the rough grassland that their prey lives in. 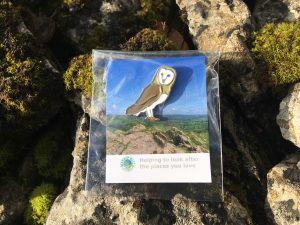 The barn owl badge joins the collection of adder, dormouse, Chalk Hill Blue Butterfly and Greater Horseshoe Bat that people can make a donation for. The badges are available through a number of pubs, shops and tourist outlets in the area. Over the last 4 years the badges alone have raised £2500 for the fund. The fund is supported by visitor-giving schemes and this year will be giving out £11,000 to projects that improve the Mendip Hills. The Mendip Hills Fund this year has given grants to a forest school, supported a book on orchards in Blagdon, a school environment club and improved signage on a Somerset Wildlife Trust reserve. Over the last 4 years since it started the fund has given out £20,000 to local projects. The fund is a partnership between the Mendip Hills AONB Unit and the Somerset Community Foundation. To find out more click here.